More than 130 villagers from 20 villages in Hlaingbwe and Hpa-An Township signed a petition letter and sent to the state parliament demanding a solution to the dispute over farmland that was granted concession to businessman for a rubber plantation. Daw Nan Say Awa, a member of parliament from the Pyithu Hluttaw [House of Representatives], Karen State said that the residents submitted their letter to the parliament along with their signatures on March 13, requesting the relevant authorities immediately resolve the land disputes at Hti Lon and Kyone Pa Ko reserve forest areas in Hlaingbwe township, Karen state. Daw Nan Say Awa spoke to Karen News about the dispute. The villagers petition letter submitted through the Member of Parliament, Daw Nan Say Awa, was signed by 130 residents from 20 villages. Villages include Naung Ka Myaine, Hti Lon, Ta Wun Phan Ya, Ta Pu Hto, Mine Kan, Kyone Pa Go, Dine Pya, Myaine Tha Yar, Nong Pa Na Mein, Kyok Chaung and Nan Htike San villages in Hpa-An and Hlaingbwe Township. Villagers claim that the disputed land was leased out to businessmen from Mon and Karen state for rubber plantations by the State Forestry Department. Naung Ka Myaine villagers, one of the affected villages, said that they were troubled when they saw company workers start to prepare their farming land for rubber plantation. 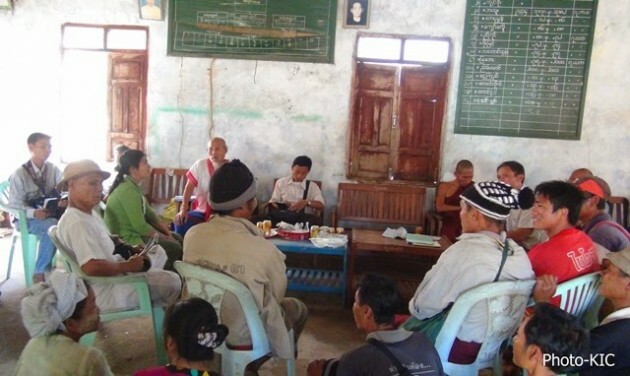 Saw Thein Aung, a farmer from Naung Ka Myaine village told Karen News that in an effort to resolve the dispute, Naung Ka Myaing villagers and the new leasers of the disputed land held a meeting on February 20th at the village administration office. The meeting failed to produce a solution. Saw Thein Aung said that villagers were not aware of their being leased out until recently. “There are more than 50 villagers from Naung Ka Myaine village alone who have been working on the land that has been leased out. If other nearby villages are counted, there will be well over 1,000 acres of villagers land that has been leased out. Now our land is completely in their hands. We do not know which the authority has granted land concessions to. We only knew [about it] when we see their [company] workers started working on clearing the land,” Saw Thein Aung said. According to village sources, a contract has been signed between a company and the Karen State Forestry Department with an individual who has been granted 50 acres in the Hti Lon village forest reserve on 14th July 2013, for a rubber plantation. Village sources said that the contract entitled the company to use the land for 30 years at the rate of 500Kyats (around US50 cents) for one acre of land per year. Saw A’ Naing Min, a farmer from Naung Ka Myaing village, told Karen News that authorities and the company have no compassion for local farmers. Saw A’ Naing Min said that he wants the government to solve the problem fairly. He said that the root cause of the problem is due to lack of transparency by authorities. Saw Min Aung Lin, a member of State Parliament who was granted a land concession, in the disputed area, by the State government told Karen News that he was not given the concession because of his official status. Villagers argued that the disputed land have been worked by their ancestors since before the time the Burma Socialist Programme Party was in government – 60 years ago. In addition, villagers said that they have to pay taxes for the land both to government and the Karen National Union (KNU) every year. According to local sources, on March 11, U Ye Naing, district administrative officer from Hpa-An township and some officers from forest department came to see the residents in Naung Ka Myaine village to discuss the issue but again fail to resolve the problems. Naung Ka Myaine villagers said that following the land dispute problems at Hti Lon and Kyone Pa Ko reserve forest area, police officers and government troops have been moving in and out of Naung Ka Myaine village area frequently.